The reception will feature a continuous cycle of five-minute excerpts from all five commissioned artworks. Artists in attendance. Entrance to the atrium is FREE and open to the PUBLIC during the building's business hours. 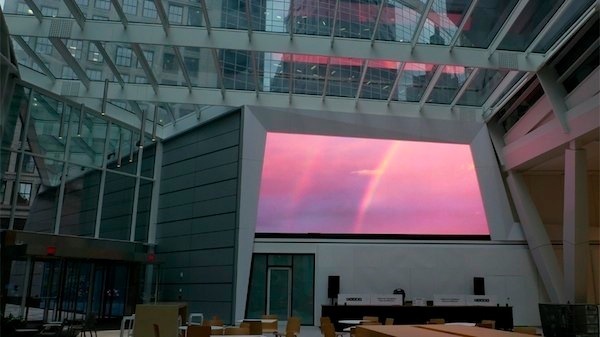 The screen can also be seen from the Congress St side of the atrium 24 hours a day. This schedule is current as of Sept. 25, 2018. Screening times are subject to change without notice. The other four artworks run on their own schedules. Boston Cyberarts is pleased to have curated new digital art for Boston Properties’ new video wall in the courtyard at 100 Federal Street, their 37-story, Class A office tower located in the heart of Boston’s Financial District. They have constructed a new street-level glass atrium adjacent to 100 Federal Street along Congress Street. Open since late February 2018, the glass atrium features 8,500 square feet of retail, 500 square feet of kiosk space and a 8,990 square foot year-round garden.